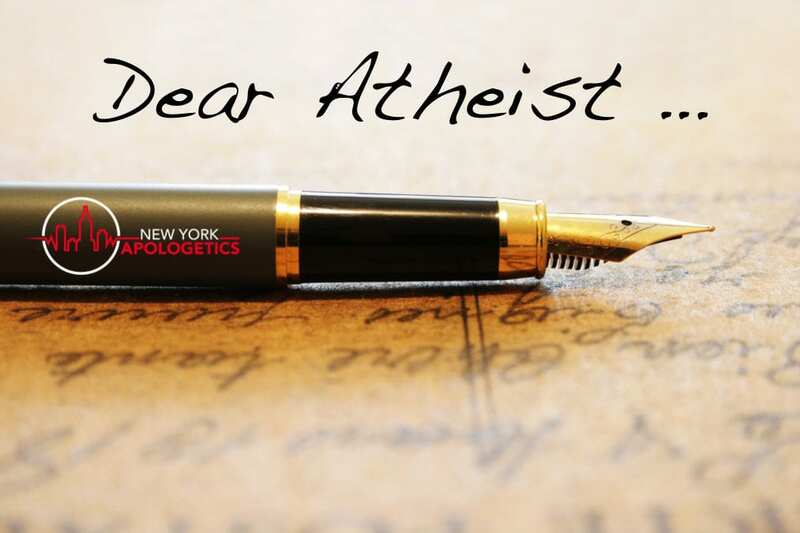 Whether you are an Atheist or a Theist, the Law of Non-Contradiction as explained in this segment of “Dear Atheist” should be of great concern to you with respect to the position you hold on the question of whether or not God exists. Most of the atheists that I encounter would agree that there are at least three positions when answering the question of God’s existence. The question: Does God exist? No, God does not exist. The Law of Non-Contradiction removes one position as an answer. This Law of Non-Contradiction states that contrary statements cannot both be true in the same sense at the same time. “A is B” and “A is not B” are mutually exclusive. Logical Answers for both the Atheist and the Theist. Because the question is either true or false, there are only two logical answers. The “I don’t know if God exists” statement is not a valid answer to this question with regard to truth. Either the statement is true, or the statement is false! There is no other possible answer. You can plainly recognize that the Law of Non-Contradiction does not allow for Agnosticism or the ‘I don’t know if God exists claim’ as a valid answer. While one can hold the position of agnosticism or withhold answering the God question, one cannot assert agnosticism as a legitimate answer to the truth of the God question. Conclusion : It is either true or false. If you are an Atheist and think that you do not have to assert that God does not exist, think again. You have an opportunity to choose your answer to this question. Choose wisely. That was very poor article and the author doesn’t really understand the terms because he starts with the wrong question. Because it is about belief. If you say “Yes, I believe there is a god” you’re a theist. If you say “No, I don’t believe there is a god” you’re an atheist. The option of knowledge is covered by (a)gnosticism. The author also fails at basic logic and its application. That’s not how you can exclude an answer because of the “law of non-contradiction”. It’s not in the same logic term. But I guess he had to do that flawed step because he asked the wrong question. The question is correct and it’s relation to the Law of Contradiction is quite clear. Understanding the question this way shows that there is an absolute answer even if we claim to not know what that answer is. Belief is, in this instance irrelevant. Perhaps you have missed the point? No, there are three answers, and you have not demonstrated that there are only two. You have asserted that rejecting a proposition requires it to be both true and false and the same time. This is patently false. If I reject the proposition “biological life definitely exists outside the solar system”, what is my position on biological life outside the solar system? If you are suggesting I must believe now that life definitely doesn’t exist outside the solar system, that’s absurd. You’ve made a very simple logical error, and the error is on your part yours. If I reject any proposition which can either only be true or false, I am not claiming that they literally exist in a state of being true and false. That is a separate claim, and one I am not making. I am simply rejecting your claim. It’s really that simple, and you’ve missed the point here by light years. If you’re correct and there is a third option besides true or false, I simply reject your assertion. Now, your assertion is neither true or false since I reject it! Your position is illogical beyond words. Atheism is a doxastic claim about one’s psychology, it’s not an existential claim. There is only one truth from two possibilities – God Exists or God does not Exist. There is no third option! Your belief, lack of belief, lack or knowledge or any other position or answer does not change the true answer to this question. It is either true or false according to the Law of Non-Contradiction. There are two possible positions one might take, True or False, but only one of these is correct. The question,” Does God exist?” can only have one true answer. The true answer to that question allows for only two possible choices, Yes God exist, or its opposite. You keep referencing belief which is inapplicable here. Your rejection of the proposition speaks to your state of mind, not the truth of the answer to this question. You are confusing an argument for the truth with your personal state of mind. Atheism isn’t an existential claim, it’s a statement pertaining to what I believe. There are not only two belief positions on any claim. If you think this is not the case, you’re rejecting basic logical principles. And there’s simply no serious conversation to have with someone who rejects basic logical principles. Dear Sir, I can understand why you would become snarky. That being said, your feelings do not matter when considering the truth claim itself. For example: The world is flat, the world is round, two opposite truth claims. You may believe that the world is flat but the truth has always been independent of belief. God exists or God does not exist, only one of these can be true independent of your belief. You say that you can not have a conversation with someone who rejects basic logical principles, how about the basic law of logic called the Law of Non-Contradiction. You seem to miss the meaning of what was written because you are too concerned with your personal belief rather than truth. There is a difference. This article is about the Law of Non-Contradiction with concern to the question of the existence of God. If you believe that God does not exist, you must have a reason or reasons. I would love to hear them. People who assert that they do not know God exists, are not making the claim that God both exists and doesn’t exist simultaneously. This is so trivial to point out that it beggars belief. Again, you’re simply confusing basic logical principles. If God either exists or does not exist, there’s no logical requirement to make a claim either way. You’re still confusing a doxastic stance with an existential claim. Until you disabuse yourself of this error, there’s no serious conversation to be had. Your premise is wrong. Look at the word agnosticism. The root of the word is the same that makes up the word knowledge. The question is not does god exist, but do you KNOW god exists. Since it cannot be proven or disproven that god exists the answer “I don’t know” is very relevant and valid. This question has God as it’s subject. It is inquiring about the reality or truth of the question. Because of the Law of Non-Contradiction, the answer has to be either yes or no. Do you know God exists? – This question has you as it’s subject and that subject change makes this question now refer to the person’s state of mind instead truth or reality. The original question refers to objective truth not subjective truth. Correct! That’s because that’s what agnosticism means. It is a word that requires subjectivity. So, while the question does god exist or not has only two answers, agnosticism doesn’t have anything to do with that argument. Agnosticism only cares if you can KNOW. It’s only AFTER that is established, that we realize that the objective question of God’s existence is irrelevant. We cannot prove he exists one way or another, so making that binary choice is moot. You are right to say “agnosticism has nothing to do with the argument” which leads me to ask you “why would you bring it up?”. The statement “God exists” is either true or false – you not knowing the answer does not change the immutability of the laws or logic. And, saying the binary choice is moot only applies if God doesn’t exist. If He does exist, the correct choice becomes paramount. Why would I bring it up?!? Because its in the title of your article. DUH! lol. You are having two different arguments here. One- Can we KNOW (or prove) God exists? Agnosticism answers the first by saying that we cannot prove gods existence. Therefore we cannot know that god exists or doesn’t. Atheism answers the second by saying I choose to live my life as though there is no god. Whereas a theist chooses to live their life as though there IS a god. That is fine too.. but dont confuse the two arguments. We agree on that Chad in that there are only two possible correct answers to the question “does God exist?” – that is the point of the article. I don’t know, or agnosticism can be excluded from the possible answers to the first question. So, I’ll ask you: does God exist? That is a question that no one can answer with any degree of certainty. So it becomes a very boring question, very quickly. That is why agnosticism is relevant.